After passing B.A./B.Sc. or having equal education, students can apply for private MA exams. Many students appear as private candidate for M.A./M.Sc. from Punjab University. As these are not regular students of any college, so have not any source of information. They usually found it very hard to get any information regarding their registration, admission etc. I have decided to publish this post in which I will try to list all frequently asked questions (FAQs) and will also give their authentic answer. Question: What is M.A. subjects list for private candidates? Answer: Following subjects can be taken by Private candidates for taking M.A. Exam. Q: I have done my BA from Punjab University. Will I need registration for MA as private student again? A: No, you don't need separate registration for M.A. Existing registration of BA will be OK for MA. Q: What documents are required to be attached with registration form? Q: From where to get registration form? Q: What is registration fee for private students? A: Registration fee is Rs.2875. Q: When are private registrations open? A: PU open registrations in November (with single fee), in December (with late fee) and in January (with double fee) each year, approximately. Q: What is the difference between registration and admission process? A: Registration is mandatory before examination admission. Registration process for private candidates usually starts in November; almost one year before the exam’s commencement and admissions usually starts in February. Q: Can I send the registration form or admission form by post? A: Yes, Registration forms and admission forms can be sent by by post as well as by hand. But only one form can be posted in one envelope. Q: What is examination admission fee for M.A. for private candidates? A: Rs.4250 is single fee for each part (Part-1 & Part-2 separately) while Rs.8500 is double fee for each part (Part-1 & Part-2 separately). Q: From where to download admission form? Q: When are private admissions open in PU? A: Punjab University open admission from February to March each year, approximately. Q: What documents are required to attach with admission form? A: Candidates are required to attach the attested photocopies of the following documents along with the admission form. Q: Where to deposit fees? A: Registration or admission fee can be deposited in any Online Branch of HBL Bank. Students can get registration and admission form from the following branches of Habib Bank Ltd. (HBL). Q: When does the university start MA exams? A: Usually, annual examinations of MA by Punjab University held in the month of July every year. Feel free to ask any question in the comments section regarding MA private. Is there any examination centre in Islamabad for private candidates? Agar b.a ka result card abi na aya ho to registration ho skti hy kya? Nahi MA Education private nahi hota. PU sirf ooper list mn mojood subjects mn he private MA krwati hy. MA admission k liye Ba Bsc me kitny percent marks ka hona zroori hai ???? Aoa..I wanted to know can I get admission in ma Islamic studies frm PU.. I hve done BA psychology from Virtual University of Pakistan? Does punjab university consider virtual university degree??? Mujhe ye pochna hai k b.a pass kiya us k bd double math k paper k bary mai kia detailed hain for private student???? mera ma part2 political science ka result card nayn mila.please tell me about issued or not issued my result card. can we do double masters? as i am already doing ma in english as a regular student. is it possible to do Ma Islamiat privately from punjab university? i want to know that when i recieve my registration number from pu ? as i submit the registration form yet..
Is registration card copy compulsory for private exams. How much marks should be required for M.A Admission? Bank by hand b admsikn form submit kr sakty hain ya sirf online fees hi jama ho gi? Please tell me about M.A English for private students. examination centre for M.A private students......? Can any one appear in both parts in one year? is there any possibility of appearing in part 1 and part 2 in the same year? Yes.If you have passed Bachelours two years ago.You have to submit two separate forms though. Kya m.a islamiyat part 1 k private students 70% marks k sath laptop scheme k liye aligible nhi ho skty?? Reply me please! I want to know about MA part 2islamic studies private date sheet n registration??? Ma na 2015 ma MA ENGLISH part 1k exam diya tha.2 subject ma supply thi ,lakin kuch domestic problem ki waja sa ma clear nai kar pae or discontinue karna para. Kiya 2018 ma jo annual exam hun ga un ma ma part 1&2 combine da sakti hun . Please reply ma must . I am worried. Can we tak ma economics exam 2017 in urdu version??? Kya ma economics k paper urdu mn dy saktay hn????? Under the new regulations, students can take composite exams. The practice had been discontinued in 2010. Students can now take the MA Part 1 and 2 exams in a single year or in two years. Only students who have passed their bachelor’s examination two years ago will be eligible to take these exams. Sir m ny 2009m ba kiya pu sy. M ab ma urdu krna chati hon..
Me me 2002 me BA kia tha ab 2018 me MA English k papers dene ka socha ha.2002 me mere father ka purana id card tha phir un ki death ho gae ab agar admission form fill krte hoe me purana no likho to objection toh nhi lage ga? Is there any exam center fr m.a eng in DST khushab..
kia punjab uni partibt MA mass communication kara rhe ha? A.O.a bhai jan agr m.a urdu mn admission lna ho to as a private studnt to kya krna hoga .abi abi b.a kea ha U.O.S sy ist division ha total marks 480 han to m.a urdu krna ha pujnb sy eska mukml process bta skty kan kindly. im waiting. a.o.a kindly clear my confusion. I am doing regular MBA from University of Education. Can i do MA economics private while doing MBA regular at the same time? can anybody share with me information. i didn't take one paper of m.a urdu part 1 as a private candidate . now what should i do. plz tell me.what should i do. i didn't take one paper of M.A urdu part 1.
kya Private candidate of M.a Sargodha me ksi jga Punjab uni k exams centre hy ya Lahore hi paper honge? what will be the process of study? I did masters in Economics in 2001 which is a long way back. Could you pl tell details about the course outline/ curriculum for year 1 and year 2 respectively? I have forgotten it completely, but need it now some reason. Pl guide if you can! Meri part 1 main 3 subject main supply ai hai to kia ab main is saal part 1 k sath part 2 k paper bhi de skti hon kia?? Ma education privately ho sakta ha Kay? I already done m.a Islamic studies. now I want to appear in m.a udru this year. now should I attach previous m.a result card with admission form? ??? I hope you are fine by the grace of Allah, i have to ask one question about my M.a English program as a private student. i have passed m.a part one by parts in 2013 and in part two i was failed and do not attent examination till now. can i complete my part two this year, because i could not freex my m.a part two. there is five year gap between m.a part on or part two now. Agr ap ko BA kiye hue 2 years ho gaye hn. to ap donoon parts mn ek sath appear ho saktay hn. Is k liye ap ko Part-1 aur Part-2 k forms alag alag bhaijnay hoon gy. i hv passed my "MA Political Science" in 2015, i only received my mark sheets, but i did not receive my degree yet. if i have to apply with its fee, is there any other option. if already registered in pu then what is last date for submission of admission form for ma part 1 as a private candidate? 19 March 2018 for MA Part-1 by post and 28 March is the last date for submission of exam form by hand. I am B.Sc in Maths,Stat,Eco. May i appear in M.A Persian Exam as a private candidate? PU me MA Pol Science Urdu medium me he ya Eng??? what is procedure of admission if student in not registered? M.A k composite exams dainy k liay admission ka kya procedure hy? Please guide me regarding Thesis for MA Political Science. 1. how and when to submit thesis. is it submitted after exams or before? 2. Is it compulsory to submit thesis or optional? I have done my B.B.A Hons... can I eligible for M.A English. ? Aoa If student has cleared part 1 ma english from PU and unable to give exams of part 2 due to family issues then how long part 1 will be valid? I mean for how many years student can appear in part 2 exams? I am in doubt that part 1 will be vanished out after gap of so many years or we can give part 2 whenever we want to give exams. Thankyou in advance. PU does not offers private MA in journalism. Do I have option of masters in gender or woman studies as a private candidate? M M.a krna chahti hu. M already is university sy regested hu. M 2 month bd karachi shift hu jao gi ..mry liya punjab ana possible nhi .Kia agr m addmision bhjo karachi ka address pr tu ...meri slip karachi ka address pr aye gi or mera centre karchi ka bny ga? M.A Sociology as a private ?????? You can take only following subjects as a private student of MA of PU. 1) Yes you can send admission for MA combined for both years. 2) You don't have to get registration again. Previous registration with PU is enough. 3) Books for MA Islamiyat are available at Book Stores. M.A pol science kalayia kon sa publisher walow ki books achi hai please tell me name? I think Dogar Publishers is good. Hy Gul Chaudhry. I was searching for information about M.A Islamiat. As i am interested in doing it. Can i have a piece of information from you? Kindly Mail me at zamjad810@gmail.com so i can ask yu few questions like. Will it be eay for me to pass these exams as m already doing job and i have to prepare for it as well to appear in exams of 2019 in July? No there is no age limit for MA Private. Aur BA private k liay koi age limit hy? No age limit for private candidates. Me ne BA me optional subjects islamiat+ journalism Rakh liay tay aur elective ma arabic.kia me MA history kr skta hun.MA islamiat ma already kar chuka hun. Q. is any age limit for MA private examination? I've been a regular student at Punjab university for three months but due to some domestic problems I can't continue Being one. Can my admission be privatized?? Sir, I have passed B.com from pu in 2009. After that i have passed B.ed from university of education Lahore in 2011. Now i want to admission in m.a as private candidate. Please guide me in following quires. 1- Does i need registration? Sir what's the last date of admission in m.a part 1 for private candidate?? Main ny M.A English part 1 2015 main kiya tha clear. Usky baad job ki waja sy part 2 nahi kar ska. Kya main 2019 mn part 2 ka imtehan dy skta hn? For M.A political science, is thesis compulsory for private candidate? Thesis is optional for 2nd year students. You can take it instead of 2 optional subjects. It carries 200 marks. 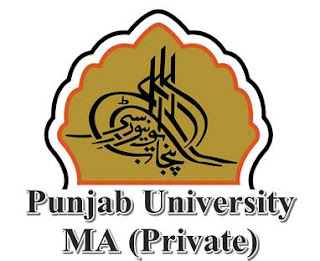 PU doesn't offer MA Education for private students. Ma polical science part 2 k compulsory or optional subjects kya hain plz mjy bta dain mjy pta nhi chal rha....plz bta dain...private students ko tou thesis ka masla nhi hota na? 1) Comparative Political Systems 2) Pakistan Movement are compulsory subjects. While you have to choose 3 more optional subjects from The Muslim World, External Relations of Pakistan, Foreign Policies of Major Powers, Internal Law, International Organizations, Political Sociology, Local Self Government in Pakistan, Public Administration, Defence and Strategic Studies, Modern Political Thoughts, Political systems of various countries etc. Isk papers kb hoty hyn annual??? please tell me and course outline kahan se mily gi? Agr ap ny BA ya BSc 2 years pehlay pass ke the to ap dy saktay hain. Agar b. A ma economic na ho phir bhi M. A economics kar sakta hain kya? aoa, i recived registration card for m.a,private from the university of punjab recently, tell me pls how can i submitted examination form. MA urdu k paper diye thy part 1 k but that was very tough i didn't pass now i want to change my subject to political science pl, tell me it possible changing the subject..? You are advised to contact University management regarding such matters.